Me and my Chinese Mother-In-Law: First Impressions | WWAM Bam! As International Women’s Day approaches, Felicity shares her experiences with the one woman who is in most cases a crucial part of WWAM life; the Mother-in-Law (MIL). A major presence in the lives of WWAMs is in many cases the Mother-in-Law. My MIL experience has differed from others, as I am the negotiator between her and her son. But that’s another story. 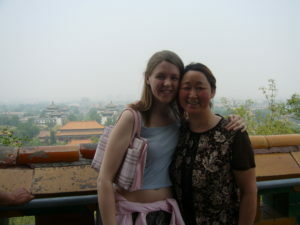 However, for those who struggle with their Chinese MIL, I hope my experience can help you on your journey. I love my Chinese MIL so much that at a visa hearing in a Glasgow court I said that she was as important to me as my husband. We lost the case. I don’t blame the judge for believing my statement of love to be an exaggeration. After all, it is a rare MIL/daughter-in-law (DIL) relationship dynamic to share. Our journey isn’t one that will make you reach for the sick bag. It has been a voyage. Actually I should say it is a voyage. The first time we met was over the phone. She was working at a coal mine in Inner Mongolia having run away from home several years back due to extreme domestic violence. As a result, the family was split up completely: my husband grew up with his maternal grandparents and was a boarder at school in the town; his younger sister had been forced to leave school aged only 13 to work in the provincial capital alone to pay for my husband’s school fees; and their youngest sister was living with an elder cousin while attending school in the village. My husband called his mum the day after he proposed in the summer of 2003. We never dated. Our relationship began when he proposed after several weeks of him not noticing my not very subtle hints that I liked him. He had made a promise to his mother several years back that he wouldn’t date until he had completed all his education. He was still only in his second last year of high school (a year older than me). I took the phone from him and she didn’t know what to say. I tried to reassure her in the most basic of Chinese that we were both serious. She just couldn’t understand what I saw in her son and had always worried about how he’d find a wife without any money. A foreigner? Impossible. But there I was. The first time I met his mum in Inner Mongolia she was too embarrassed about our surprise drop-in to her cave that even the summer heat wasn’t hot enough to melt away her frost coated attitude. She handed me a pair of lovingly hand made, embroidered shoes with matching embroidered insoles. In China they would say it is fate, and meant to be. Even though we had never before met in person, and my feet were larger than the average Chinese woman’s delicate size, the shoes were a perfect fit. I must admit, first impressions weren’t great but I caught her smile when she saw my enthusiasm in her handiwork. I didn’t see any of the usual tourist sites of the grasslands. We stayed the night in her on- room cave cut into the side of a black sooted hill next to the unlicensed coal mine. A few months later we came face to face for the second time. It was the Chinese New Year and I had just taken the 24 hour overnight train from Beijing to Lanzhou followed by the six hour bus ride to my husband’s school. The tightness of the black leather jacket complimented the cold harshness in her stare. It was winter. My Chinese had improved greatly but the Gansu dialect makes people sound forever bitter and angry. We said our goodbyes as she took her onwards three hour bus journey into the mountains to where her parents still lived. My husband explained to me that she was upset we couldn’t go to grandfather’s as I had developed a fear of the precarious mountain roads. Not only was it on the edge of a cliff but rocks sometimes fell onto the dusty road and it was currently covered in thick ice. Apparently grandfather had been preparing for my visit, worried that I wouldn’t cope with his living standards. The bed (shared by the whole family) was made from a hardened mixture of earth and hay, as were the three rooms in the courtyard. 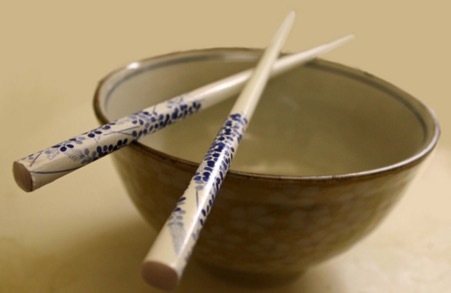 He worried I’d not like using his old chopsticks so had especially bought new ones. Oh, those chopsticks. They picked away at my stubbornness and prodded my conscience. Several hours later, I had hired a taxi with chains attached to the wheels and bought a boot full of vegetables/fruit, sweets for grandfather, and cakes/biscuits for grandmother. I was a terrible back seat driver. We arrived at the hamlet and surprised everyone. MIL’s icy front melted away instantly; and all thanks to a pair of new chopsticks. How did your first meeting with your MIL go? Let us know in the comments!